The Pistoresi family has a long history in the transportation industry that dates back to the early 1900’s. Nello Pistoresi started out making home grocery deliveries via horse and wagon. Around the time the automotive industry had expanded into commercial equipment, Nello decided early on to invest in a 1929 Single Axle Chevrolet truck to branch out into hauling livestock. Although he was only moving one to two head of cattle at a time, Nello was convinced the direction he was going in would pay off in the long run. 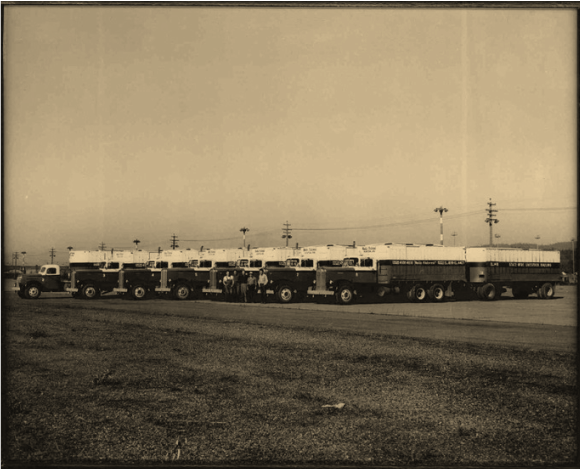 In 1940 Nello went into the trucking business full time, specializing in hauling livestock. For a decade Nello ran the business solo until his son James (Corky) decided to join his dad in running the family business. In 1950 the business officially became known as Nello Pistoresi & Son. Together they built a premier trucking company that at one point was the largest livestock hauler in the western United States. Corky, Nello’s son took over the business full time in 1960 and continued the family tradition of hauling livestock for the next 20 years until the deregulation of the transportation industry. 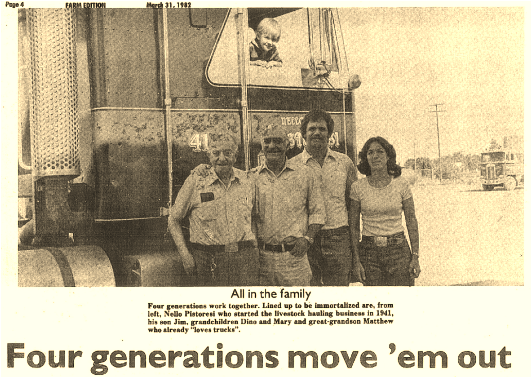 With the transportation deregulation in 1980 came a downward turn in the need for livestock haulers and business grew slim for Nello Pistoresi & Son. As a result of this change the family made a conscious decision to transition out of hauling livestock into transporting refrigerated goods, mainly for major grocery store chains. Nello Pistoresi & Son continued to expand and grow their refrigerated business throughout the Pacific Northwest region for the next 25 years under Corky and son Dino, before transitioning the day to day operations over to his grandson Matthew Pistoresi in 2011. Matthew brought the company into the 21st century with state of the art technology interfaces that will put a greater emphasis on providing industry leading service that Nello Pistoresi & Son customers and partners have come to expect. In addition to strengthening the Transportation arm, Matthew partnered with a Senior Logistics expert to start a Logistics division of Pistoresi Trucking in 2015. The Logistics group will specialize in providing full truckload services for customers who have a need for multiple types of equipment. As Nello Pistoresi Trucking & Logistics continues to grow and expand its operations, they will maintain their commitment of providing quality service and partnering with the best providers to ensure all of its customers transportation needs are met.